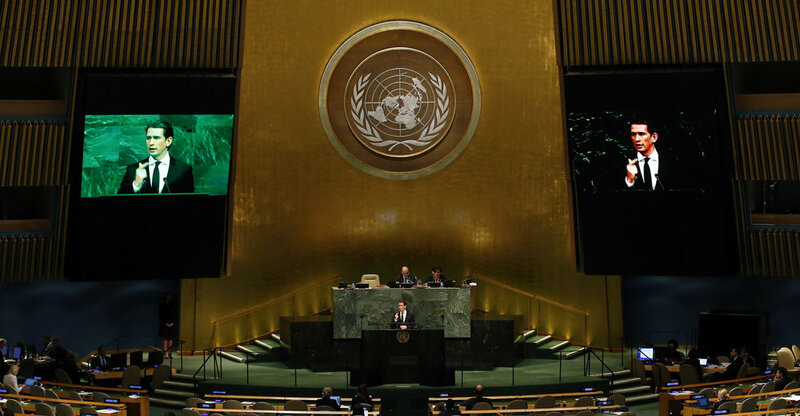 From September 18-21, Foreign Minister Sebastian Kurz was in New York City for the 72nd Session of the United Nations General Assembly. He joined Austrian President Van der Bellen at his meeting with UN Secretary-General Antonio Guterres, who thanked Austria for her support on policy and as the 3rd Headquarter of the United Nations. Among the topics discussed during this bilateral meeting were the large movements of refugees and migrants, climate change and the situation in the Western Balkans, as well as cooperation between the United Nations and the Organization for Security and Cooperation in Europe under the Austrian Chairmanship-in-Office. The Austrian Foreign Minister appealed to the 193-member UN General Assembly on Tuesday that only international cooperation could solve challenges States and institutions faced, ranging from conflicts worldwide to poverty, hunger and climate change. As Chairman-in-Office of the OSCE in 2017, he cited the fight against terrorism and radicalization as a priority for the organization, pointing out that it would be necessary to destroy radical groups not only where they thrive, like in Syria and Iraq, but also to fight radicalization within societies with police measures and by protecting the youth. Foreign Minister Kurz said that Austria welcomed the Vienna Agreement (Joint Comprehensive Plan of Action - JCPOA) on the monitoring of Iran’s nuclear activities as well as the Adoption of the Treaty on the Prohibition of Nuclear Weapons, which both represented key steps towards creating a safer world. Committing to defend Human Rights, the rule of law and good governance, he called for support for Austria’s candidacy for the UN Human Rights Council for 2019‑2021. Watch his full UN speech here. The treaty, the first of its kind, was signed on Wednesday by 50 countries, with others to follow. The signatories are barred from developing, testing, producing, acquiring, possessing or stockpiling nuclear weapons. Austria was instrumental in creating this historic accord, notably by organizing a conference on the devastating humanitarian consequences of nuclear weapons in 2014. On the sidelines of the UN General Assembly, the Austrian Foreign Minister held bilateral meetings with the Foreign Minister of the Republic of Korea, Kyung-Wha Kang, with the Hungarian Foreign Minister Péter Szijjártó, with former U.S. Secretary of State Henry Kissinger, and discussed economic cooperation and European challenges with Philipp Roesler of the World Economic Forum. He also joined President Van der Bellen at his meeting with President Hassan Rouhani of Iran.